As Puerto Rico claws back from its epic blackout, a battle is sharpening among the three government entities that want to break up the enfeebled power company and dictate its future. Yesterday was the four-month anniversary of Hurricane Maria, which smashed much of the electric grid. Infighting only promises to prolong the misery. According to new figures released yesterday by the Department of Energy, 467,600 businesses and residences — just under a third of all customers — are still without electricity. The company providing that energy, the Puerto Rico Electric Power Authority (PREPA), is so broke that it had to temporarily shut down two power plants this week because it couldn't afford the fuel. The question of who will oversee its undoing became the source of new disagreement this week. Will it be Ricardo Rosselló, the island's governor, who on Monday announced a strategy to sell off much of PREPA? Will it be the federal Financial Oversight Management Board (FOMB), which is poised to judge the utility's fiscal plan? Or will it be the Puerto Rico Energy Commission, which has clear legal authority but is in danger of being voted out of existence? Each has a legitimate claim over PREPA and a certain checkmate over its rivals, like a utility-scale game of rock-paper-scissors. The battle's outcome — and how long it takes to resolve — will determine for millions of Puerto Ricans what their sources of power will be, who sells it to them and how much it will cost. It will decide whether the energy commission, the island's first-ever energy regulator, survives intact or is watered down. Also waiting are PREPA's debtors, owed $7 billion, and the mainland power industry, which is eager to participate in the island's power transformation (Energywire, Dec. 12, 2017). The latest installment of the drama began Monday, when Rosselló departed from months of defending PREPA's monopoly status and announced a plan to privatize large parts of the utility (Energywire, Jan. 23). The governor's new tack means that, for the first time, all the major players have roughly the same vision, though they disagree on execution. In October, the oversight board, which was created by Congress to steer Puerto Rico through its $70 billion bankruptcy, made its intentions clear. It assigned one of its executives, Noel Zamot, as PREPA's "chief transformation officer" with an early goal of ending its monopoly. And in January, the energy commission proposed rules for microgrids, which would throw open the door for creation of private mini-grids that would use PREPA's power lines. The energy commission has clear legal authority to dictate the outlines of PREPA, like most energy commissions on the mainland. But its continued existence is in doubt. Its authority, and the commission itself, was created in 2014, when one of the island's two main political parties, the Popular Democratic Party, controlled both the governorship and the Legislature. It installed the first-ever oversight of PREPA (Energywire, Oct. 13, 2017). In 2016, the opposing party, the New Progressive Party, won both the governor's office and a supermajority in both the territorial House of Representatives and Senate. Two weeks ago, the governor proposed a wholesale restructuring of regulation on the island, collapsing three regulators — those overseeing energy, telecommunications and transport — into a single regulator with just three commissioners (Energywire, Jan. 9). Rosselló portrayed it as a money-saving move, but the energy commission's interim president, José Román Morales, retorted that it was shortsighted to diminish the island's energy regulator during an energy crisis. Under the proposal, Rosselló would have the power to fire the current commissioners, who were appointed by his predecessor, Alejandro García Padilla. Since the hurricane, the energy commission and oversight board have had a low-key relationship. But discord between them broke into the open yesterday with an ultimatum. The dispute was over who has the authority to oversee PREPA's fiscal plan. Under the structure created by Congress to manage Puerto Rico's debt, PREPA and other agencies of the territorial government are required to submit financial plans for the board's approval. PREPA was due to submit its plan yesterday, though neither PREPA nor board spokespeople could confirm it had done so. But oversight of PREPA's fiscal plan is also at the heart of the energy commission's work. Román, the commission's interim director, has described it as a key to reforming PREPA, which before the storm had the worst performance of any electric grid in the country, along with some of its highest rates. Yesterday, the energy commission sent a letter to the oversight board, threatening to sue in federal court unless the board immediately communicated with the commission to make their lines of authority clear. The commission also argued that its legal authority over PREPA is unquestionable. "At no point has any of the Oversight Board's representatives agreed to engage in meaningful discussions," the letter says. 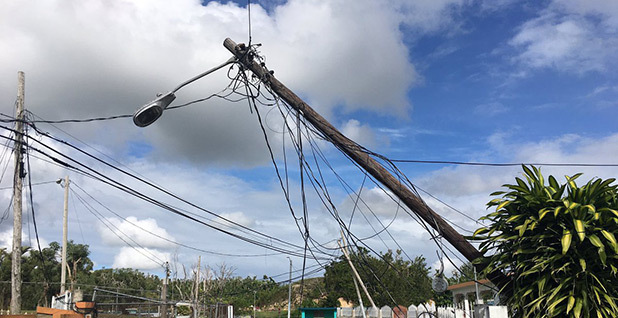 "The Oversight Board's nine-month failure to clarify our relationships, is undermining efforts to bring reliable, cost-effective electric service to ... Puerto Rico." A spokesman for the oversight board did not supply comment. Rosselló's move this week to dismantle PREPA holds some risks for him; many of its employees are among his political donors, and he can award senior jobs at PREPA to political allies. But it does align with his long-standing promises to create a more competitive and cleaner energy system. Whatever the political calculus, the oversight board is standing in his way. The issue again is PREPA's fiscal plan. After the plan is submitted to the oversight board this week, the board has the power to accept, reject or force changes to it — changes much like the ones that the governor would like to make, but outside his control. "If the board certifies its own plan, Rosselló will protest, but it is unlikely he will win," said John Mudd, a lawyer who follows the oversight board closely. Past arm-wrestling between the governor and the board has resulted in a stalemate. In November, the board asked the federal judge overseeing the bankruptcy, Judge Laura Taylor Swain, to put its pick, Noel Zamot, in charge of PREPA. She rejected the plan and instead asked the governor and the oversight board to find their way to a resolution as 50-50 partners. Now, two months later, no progress has been made in determining who will command PREPA's fate. And meanwhile, millions of Puerto Ricans wonder what sort of power system they'll have, come the next hurricane.